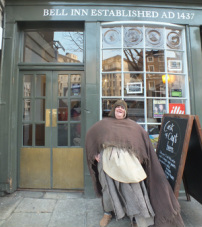 The Bell Inn is one of Nottingham's oldest pubs originally the refectory for the old friars of Nottingham. In hands of the Jackson Family for generations and now owned by Greene King. You can either join the tour at The Bell Inn or follow on from The Pit & Pendulum. At 8 pm you can either enjoy tales of Local Heroes, Drunken Friars and Bendigo the Boxer or drop out the tour for an hour Irish Folk Music and Dancing. Please make your self known at the bar so you don't miss the tour if you wish to start at this point. We leave The Bell Inn around 8.45pm to continue the journey to Ye Olde Salutation Inn. 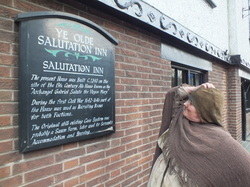 You can either join the tour at Ye Olde Salutation Inn or follow on from The Bell Inn. At 9 pm this part of the tour will be conducted in the ancient cellars below the Inn Itself, this is where you will be enticed with Ghosts, Highwaymen, Oliver Cromwell and Charles I. All this whilst your enjoying a selection of fine ales with proof of tour ticket allows 20p off your drinks. Please make your self known at the bar so you don't miss the tour if you wish to start at this point. We leave Ye Olde Salutation Inn around 9.45pm to meander our way along Castle Road to meet Robin Hood and talk about celery then arrive at the Ye Olde Trip to Jerusalem. Ye Olde Trip to Jerusalem is one of the most unusual pubs in England situated in the cave complex itself. 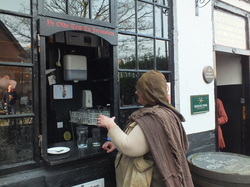 You can join the tour at Ye Olde Trip to Jerusalem or follow on from Ye Olde Salutation Inn. At 10 pm you can enjoy the superstitious Pregnancy Chair and Haunted Galleon, Kings, Murders, Badly Behaved Residents and Robin Hood. Please make yourself known at the bar so you don't miss the tour if you wish to start at this point.